How do our Affiliates Support Eat Better South Africa? 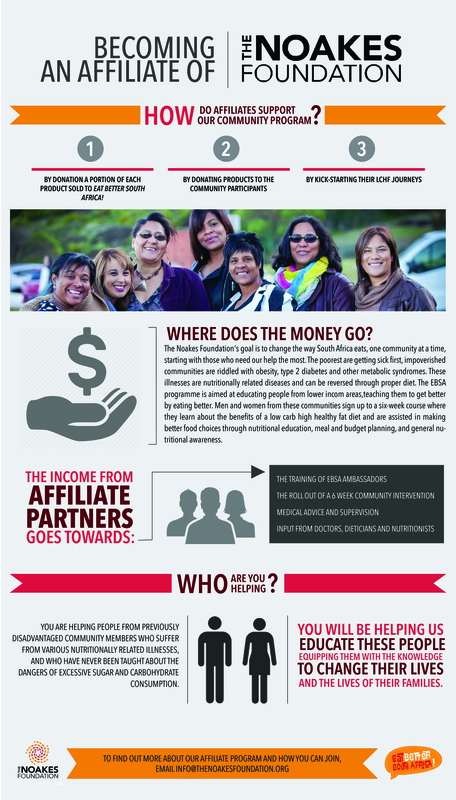 Home/Marketing & Infographics/How do our Affiliates Support Eat Better South Africa? Each of The Noakes Foundation affiliates pledges to support Eat Better South Africa! our community education initiative. 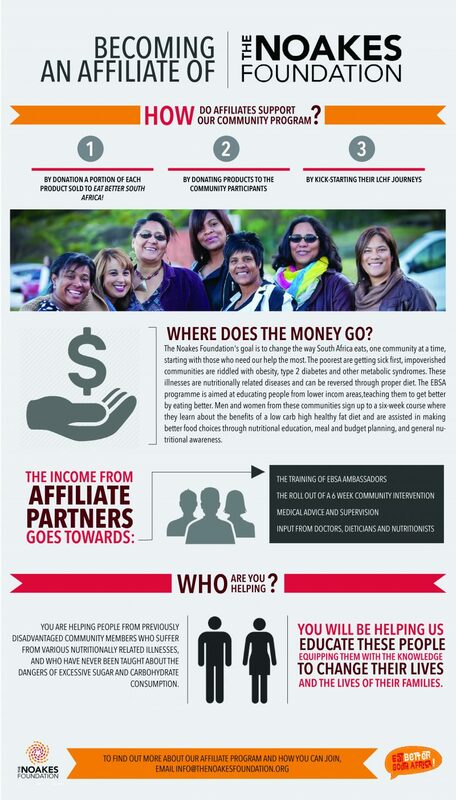 How do affiliates support our community program? By donating a portion of each product sold to Eat Better South Africa! The Noakes Foundation’s goal is to change the way South Africa eats, one community at a time, starting with those who need our help the most. The poorest are getting sick first, impoverished communities are riddled with obesity, type 2 diabetes and other metabolic syndromes – these illnesses are nutritionally related diseases and can be reversed through proper diet. The EBSA program is aimed at educating people from lower income areas by teaching them to get better by eating better. Men and women from these communities sign up to a six-week course where they learn about the benefits of a low-carb high healthy fat diet and are assisted in making better food choices through nutrition education, meal and budget planning, and general nutritional awareness. The recipients from our community programmes are from previously disadvantaged communities, schools and health groups who suffer from various nutritionally related illnesses, and who have never been taught about the dangers of excessive sugar and carbohydrate consumption. South Africa has the highest overweight and obesity rate in sub-Saharan Africa, with up to 70% of women and 35% of men being classified as overweight or obese. 2.28 million South Africans suffer from diabetes and there are millions more who are undiagnosed. Children as young as four are being diagnosed with non-alcoholic fatty liver disease. The obesity and type 2 diabetes epidemics are set to cripple global health care within the next 10 years. Something needs to be done before this happens – The Noakes Foundation is taking action through our Eat Better South Africa! program.